It's been a while since a film review has graced these pages, which isn't to say I haven't been watching some great films (The Congress) and some not so great ones (Hector and the Search for Happiness, seriously, don't waste your time on this one). However, last night I watched something that moved me deeply and I'm inspired to share my thoughts on it. 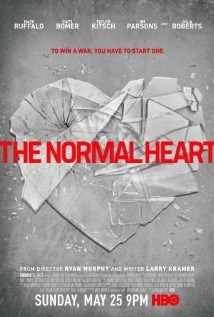 The Normal Heart is a made for television film adaptation of Larry Kramer's 1985 play, directed by Ryan Murphy. It chronicles the rise of the HIV/AIDs epidemic in New York during the early 1980s. Ned Weeks (Mark Ruffalo) is a published writer who gets curious when he sees a newspaper article mentioning a rare cancer affecting gay men in New York City. He decides to meet with a doctor (Julia Roberts) who has been treating a number of gay men exhibiting symptoms of infections which indicate they're suffering from a weakened immune system. On the back of this meeting, Ned takes it upon himself to start an organisation that promotes awareness of the disease and raises money to provide services to those effected. During his quest to raise awareness of the epidemic, Ned approaches Felix Turner (Matt Bomer) a New York Times reporter. While Felix is unable to help get the word out in the paper, he and Ned begin a romantic relationship. Some of the most touching scenes are played out between the two characters, from their initial passion for one another, to Felix's decline in health later in the film; these are gut wrenching moments brought to life by Ruffalo and Bomer. It's not difficult to see why they've both been nominated for Emmys. Ned's approach to raising awareness is to be openly hostile to the authorities on television and in person, accusing them of deliberately refraining from giving valuable support and funding to the cause. As the story progresses more and more people from Ned's social circle die from the virus. However, Ned's hard-line approach is at odds with his friends and associates and he soon finds himself isolated from the group he founded. The script is incredibly powerful and despite the film running to 133 minutes, the performances are so absorbing that the time passed in a heartbeat. Mark Ruffalo excels in this role, which is perhaps the best I've seen him in as he brings nuance and power to a character who is far from straightforward. The supporting cast is brilliant and a special mention must go to Joe Mantello who plays Mickey Marcus and has an incredible moment in the film when he breaks down, descrying his lack of knowledge of the illness and his guilt over his part in the free love movement which may have impacted the rise of the HIV/AIDS crisis. Kramer's script is superb and the audience gets a real sense of the confusion that arose in the midst of this health crisis, as well as the difficulty gay activists faced in getting the disease recognised in the face of existing prejudices. This is a film which tears at the heartstrings as only the best art can, and I cannot recommend it highly enough.